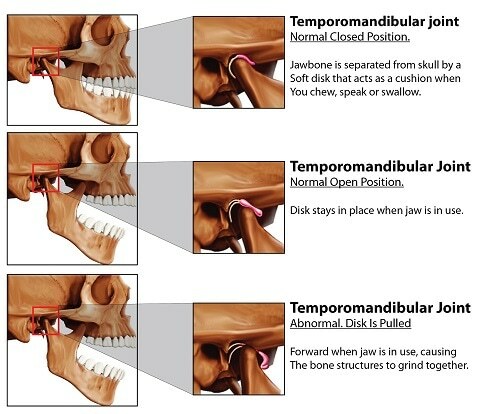 The temporomandibular joint (TMJ) is found in the jaw region, between the mandible (lower jawbone) and the temporal bone (temple). Between the two bones is an articular disc that cushions the interaction between them and allows for the hinge and sliding motions as the lower jawbone moves. This disc is void of blood vessels and nerves, making it resistant to pain, and hence allows for painless chewing, swallowing and speaking. TMJ (temporomandibular joint) dysfunction is an umbrella term encompassing conditions that result in pain and functional reduction in the TMJ or its surrounding tissues, or joint noises during motion. Up to 75% of the general population show a sign of TMJ dysfunction, while 25-33% of the population have at least one symptom. Only 5% of those showing symptoms, however, require medical treatment. There are several risk factors present in the athletic population for the development of temporomandibular joint disorder, one of which is trauma to the jaw itself. This may occur in contact sports such as soccer, wrestling, and rugby. These sports also do not require headgear; other sports, such as hockey and baseball require headgear but these may not sufficiently protect the jaw region. Some noncontact sports, such as skiing and track and field events, also have a risk of trauma to the jaw. Scuba diving as a recreational activity has garnered some attention in this area of research, as it’s been long recognized to produce major symptoms in divers who were previously symptom-free. It is believed that this is because of the forward posturing of the jaw and the clenching of the mouthpiece used when scuba diving, which causes uneven loading of forces in the TMJ region. This pain is a component of the “diver’s mouth syndrome” and accounts for 68% of dental pains experienced by divers. Abnormal dental alignment. This has been recently challenged since abnormal dental alignment is just as common for persons that don’t have TMJ dysfunction. Correction of alignment also hasn’t reliably improved symptoms. Habits such as teeth clenching, teeth grinding and lip biting. This hypothesized cause and effect relationship is also being challenged, as such habits are found in persons that don’t have TMJ dysfunction symptoms. These habits, however, may play some role in initiating and aggravating the condition. Stress, anxiety and other emotional disturbances. In support of this theory, it was found that 75% of those with TMJ disorder had significant psychological abnormalities. Athletes are at particular risk in this regard, as they are constantly under stress to improve performances. Dental procedures that require prolonged and exaggerated opening of the mouth. Pain in the mouth or face. (otherwise referred to as orofacial pain). Pain can also be described as being in front of the ears. Pain can also be present in the temple, neck or shoulders. Muscle tenderness. The muscles being referred to in this case are the muscles used for chewing (or mastication). These muscles would be tender when palpated, and the patient may feel pain when chewing, yawning, or clenching the teeth. Clicking sounds from the TMJ region during motion. Functional limitation of the jaw. The patient may not be able to fully open the jaw, or the jaw may deviate to one side as it opens. Ringing or buzzing in the ears (otherwise called tinnitus). A thorough history should be recorded, including chief complaint, history of the injury, date of onset, what increases and decreases symptoms, medical history, and dental history. A physical examination of the facial feature and posture is also done, where the alignment of the teeth should be looked at. Enlargement of the muscles used for chewing should also be assessed during this examination. This can be done by asking the patient to clench their jaw tightly. For athletes in heavy weight training, these muscles usually become enlarged. During the examination, palpation (touching) of the TMJ region is also done and usually, there is no pain if the muscles in a normal, healthy jaw are palpated, so pain is a positive sign of temporomandibular joint dysfunction. Since the mobility of the jaw is a characteristic of TMJ dysfunction, this should also be evaluated. The patient can be asked to place two knuckles in their mouth; if they cannot place two knuckles in their mouth, this can be considered a positive sign of reduced mobility. If, as the mouth opens, the jaw moves to one side, this is also a positive sign of temporomandibular joint disorder. Assessing joint noise with a stethoscope can also be done, but this symptom should only be considered as confirmation of TMJ dysfunction if there is also confirmed reduced range of motion and pain with palpation. It should also not be used to assess the success of treatment. Diagnostic testing and imaging should be used in cases of severe symptoms and depending on the condition suspected. Radiographs can be used for suspected cases of osteoarthritis, for example, but is not beneficial in diagnosing disc derangements, where there is an abnormal displacement of the articular disc. For most patients, temporomandibular joint dysfunctions improve over time, with or without treatment. 50% of patients reportedly recover within a year, and 85% recover within 3 years. Since invasive procedures carry the harmful risk of altering the anatomy of the region, non-invasive methods are usually prescribed before invasive methods such as surgery or the use of orthodontics are recommended. Treatment is based on symptoms presented and diagnosis of the specific problem. Acupressure, acupuncture, massage, temporary dental correction therapy can be utilized as means of conservative therapy. Analgesics for example acetaminophen and non-steroidal anti-inflammatory drugs may also be used for chronic pain. Antidepressants may also be helpful with chronic pain. If conservative relaxation techniques fail to reduce muscle spasms and chronic teeth clenching, muscle relaxants can also be prescribed. If there is inflammation within the TMJ, intra-articular injections with local anaesthetics or steroidal injections may be used, but only if conservative treatment has failed or symptoms become severe. Repeated application is not recommended. The articular disc between the upper and lower jaw can be displaced, which can lead to painful inflammation and locking of the jaw. If this occurs, the disk should be relocated or reduced as soon as possible. If the patient cannot do it themselves, the examiner should attempt to do it manually by placing the thumb inside the mouth and pushing down on the back teeth and pulling up the chin simultaneously. Analgesics can be given before manual reduction is done. If it is not successful, oral surgery is needed. While the use of dental mouth guards, known as occlusion splints, is very common in treating temporomandibular joint dysfunction, there is little evidence supporting it. Sailors, M. E. (1996) Evaluation of sports-related temporomandibular dysfunctions, J Athl Train 31, 346-350. Yuill, E., and Howitt, S. D. (2009) Temporomandibular joint: conservative care of TMJ dysfunction in a competitive swimmer, J Can Chiropr Assoc 53, 165-172. Buescher, J. J. (2007) Temporomandibular joint disorders, Am Fam Physician 76, 1477-1482. Aldridge, R. D., and Fenlon, M. R. (2004) Prevalence of temporomandibular dysfunction in a group of scuba divers, Br J Sports Med 38, 69-73. Suma, S., and Veerendra Kumar, B. (2012) Temporomandibular disorders and functional somatic syndromes: deliberations for the dentist, Indian J Dent Res 23, 529-536.